Roseanne Barr is going to pot with her latest business venture. The former “Roseanne” star and presidential candidate has joined the cannabis industry, via a medical marijuana dispensary that will open in Santa Ana, California, the Orange County Register reports. Barr is investing in the dispensary and will enter a licensing agreement with the business. The name of the dispensary? Roseanne’s Joint, of course. In a statement, Barr said the dispensary will be a “responsible, contributing member” of the community. Roseanne Barr, who began her career as a standup comedian before starring in the landmark sitcom Roseanne, has returned to the stage and performs the Club Regent Event Centre Sept. 8. Tickets, which range in price from $47.25 to $68.25 plus fees, go on sale April 7 at Ticketmaster. Speaking at the Yediot Aharonot and Ynet Conference in Jerusalem last week, Roseanne Barr criticized America’s far left for having “absolutely no interest” in helping facilitate peace between Israelis and Palestinians, according to the Washington Times. Roseanne Barr, who’s the former Green Party presidential candidate, decried the “naked” bigotry of America’s far left, adding that everything she believed about the left was “severely shaken.” The standup comedian also added that the scales began to fall from her eyes in many ways. Roseanne Barr also admitted that many of those she considered “comrades” turned out to be “naked bigots” who are absolutely not interested in establishing peace between Israelis and Palestinians. Roseanne Barr, who is Jewish in origin, refers to the world-famous Jewish banking family that often becomes part of anti-Semitic memes on the internet. Barr also went on to argue that the Boycott, Divestment and Sanctions (BDS) Movement doesn’t want peace, nor does it want to hold peace talks. 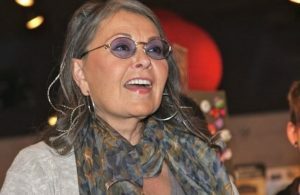 American actress and comedienne Roseanne Barr was in Israel last week to deliver a keynote address to a Jerusalem conference dealing with the anti-Israel Boycott, Divestment and Sanctions (BDS) phenomenon. Barr said that she had become a pro-Israel advocate after being “shaken” by what she called the naked bigotry of so many liberals who claim to only be criticizing Israel, but who are in fact anti-Semitic.